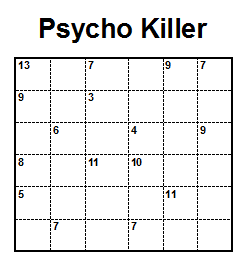 Psycho Killer is very interesting Puzzle. This is next level of "Killer Sudoku" puzzle where marking for groups is not given. This puzzle I created while practicing for one of the OAPC Championships and this puzzle appeared in my set for 11th 24Hr Puzzle Championship in year 2010. Fill the grid with digits 1-6 so that each digit appears exactly once in every row and column. The puzzle is a Killer Sudoku puzzle with missing regions. Determine the regions and solve the puzzle. Each region contains its sum in the cell which is the first left cell of the topmost cells. The is no region that contains only one digit. No digit can be repeated within a sum.